Hey all, long time no see. I haven't forgotten about you, but as usual, life gets in the way. We've been working on some home improvement, which seems to require that one first create chaos, destruction, and general disaster, before one can proceed to the progress and beauty stage of the program. Then, my back naturally decided it needed to get more attention and pitched a tantrum (also known as a herniated disc with pinched nerves). Of course, there were also food projects and just general food prep, and voila, abracadabera, eureka, caboom, we can make a year disappear. Still, I have had a longing to share something worthwhile with you fine readers. Worthwhile doesn't always mean fancy, especially when the simplest things in life can still be big stumbling blocks for individuals allergic to additives and sensitive to chemicals. 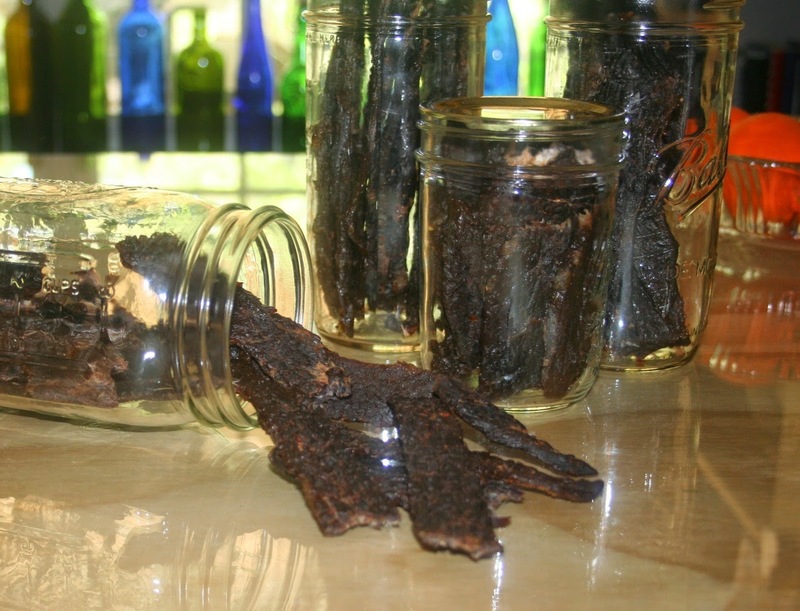 Jerky was just such an issue for me. I had always grown up with jerky that had been prepared in soy sauce, teriyaki, etc, but those ingredients are dangerous for me, so I decided to try a different approach by brining the meat. 1 Tbsp balsamic vinegar *please see "To my readers re: extreme glutamate sensitivity"
Gently heat the brine to fully dissolve the salt and sugar and encourage the flavor to develop. Allow to cool completely then add thinly sliced, grass-fed beef, (if the slices are thicker, you may want to pound the pieces with a meat tenderizer mallet. Brine overnight. My pieces were a bit thicker than I wanted (I asked the butcher cut them for me since I don't own a slicer and my knives all leave a lot to be desired), so I brined for twelve hours and followed up by placing the brine with batches of meat in a ½ gallon canning jar and using my vacuum sealer to remove the air. I wanted to be sure that the marinade was really soaked into the meat. Remove the meat from the brine and drain well. I placed a cooling rack over my sink and placed the meat on it until it wasn't dripping wet. At this point you should have your dehydrator ready and waiting. In my case, I have a new convection stove that has a dehydrate option, so I used cooling racks and covered each of my three oven racks (placed at the topmost, middle and bottom positions) and placed the meat on them without crowding too much. Dehydrating time will vary according to the thickness of the meat, your dehydrator, temperature, humidity, etc, but allow it to dry until the meat is completely dry to the touch, dark, and very stiff. 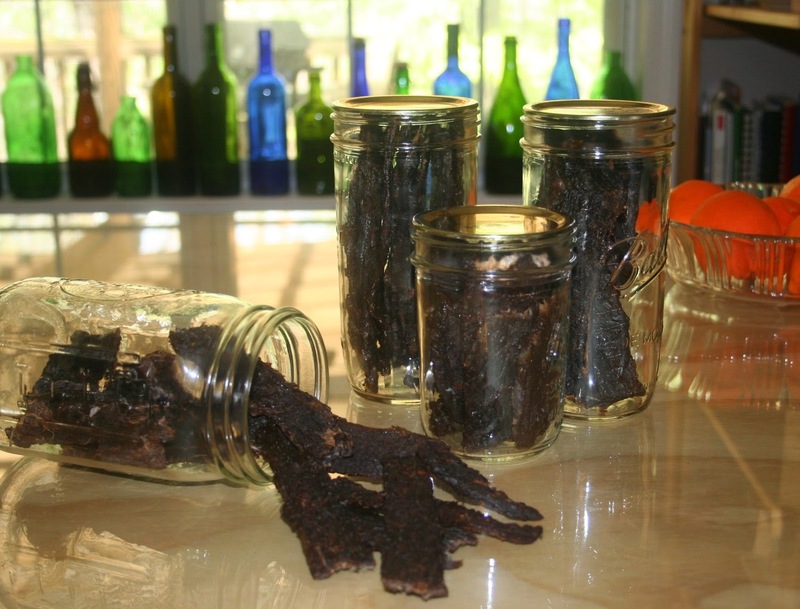 Once the jerky is done, allow it to cool completely, then vacuum seal it in bags or jars. Use common sense and food safety guidelines to choose your method and length of storage, and also take into account the climate in your area.